Eating these yesterday felt appropriate. Yesterday, Sunday February 24, while watching the Academy Awards. . my eyes glued to the TV and 2 of these buns next to me. I’m so happy for Argo and Ben Affleck! Best Picture, woot woot! 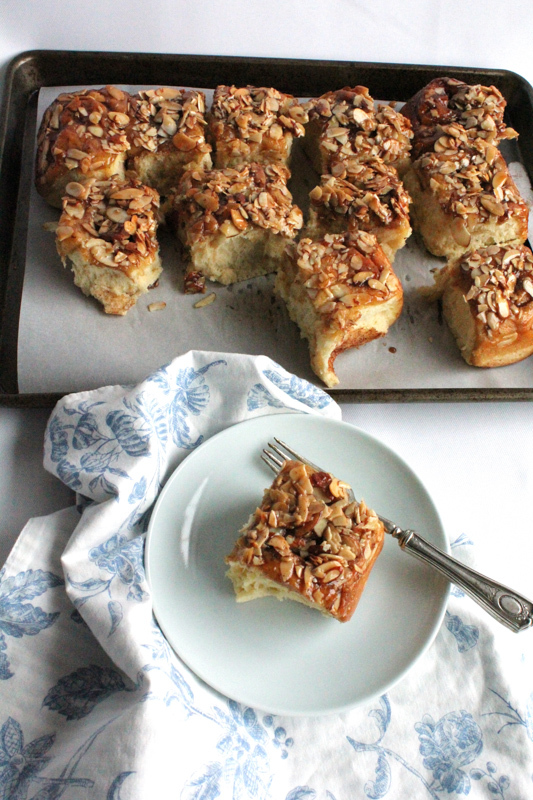 To me, these sticky buns are award show worthy. 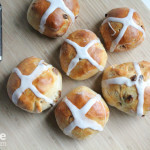 They are a huge reward and payoff after all the hard work, overnight rise and exercising mad patience while baking these. I mean, come on. It’s brioche dough we’re talking about here. And this recipe is on my 2013 Culinary Bucket List. Truth be told, this was my absolute first time baking sticky buns and I could not- for the life of me- get my damn yeast to activate in the milk (as Aida instructs). So, I dumped my milk, sugar and yeast and tried again. 4 times. On the 4th try, since I didn’t want to waste anymore ingredients- and I knew this fail-safe way would work- I activated my yeast in warm water and then after it started bubbling, I added it to the milk and sugar in my mixing bowl. And I am so happy to say. . it worked. If you only buy one cookbook this year, it must be Keys to the Kitchen by Aida Mollenkamp. I seriously cannot say enough about this cookbook. 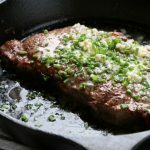 Not only does this cookbook have over 300 delicious recipes (I’ve tried about 12 so far) but it’s also a reference guide with tips and techniques to help you in the kitchen. 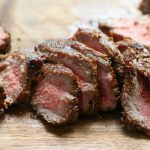 From knowing what to buy at the grocery store to how to store foods to fundamental preparation techniques to the recipes and finally to mastering the meal. It’s all there. Seriously. And it’s solid. I’m hoping my photos intrigue you enough. These sticky buns. 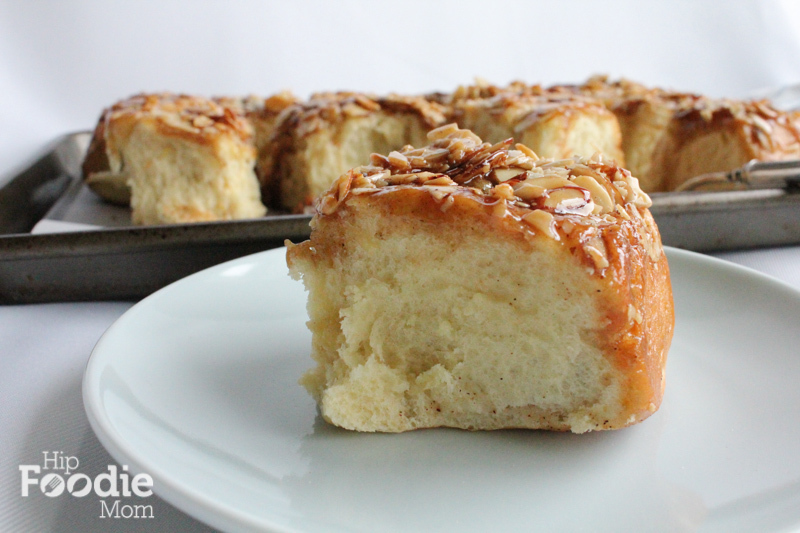 These Almond Brioche Sticky Buns. You must bake these. Must must must. They are so insanely delicious. A few things to note regarding them and what I did differently: Ok, I know this is a huge faux pas when baking but I always use 2% organic milk. We never ever have whole milk in the house. Never. Am I alone here? Also, I didn’t have any heavy cream on hand so I simply omitted it and I’m glad I did. These buns were still insanely *I mean crazy good* delicious so I can only imagine how much better they would have tasted had I added the heavy cream into the glaze. I also added some golden raisins to a very small portion of the dough because my girls love them (ended up being 3 buns). Delicious. After baking these, I seriously feel like I can bake anything! 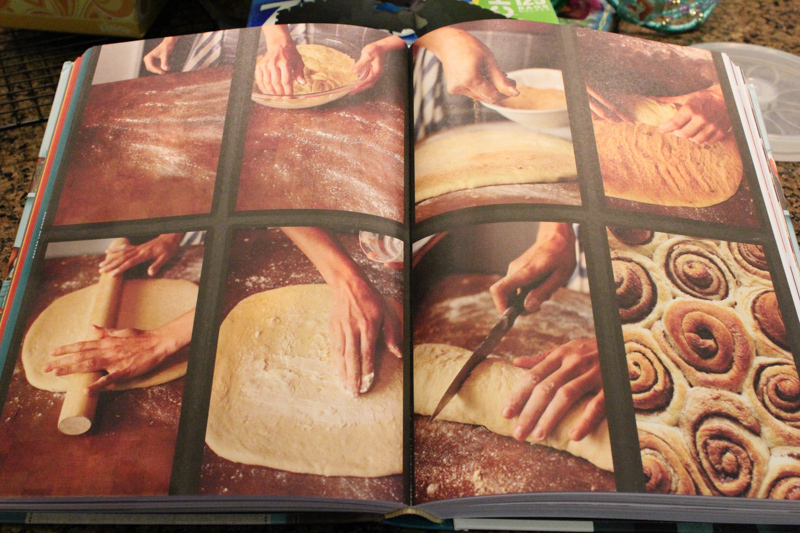 And now – thanks to Aida and this cookbook- I know how to make brioche baby. So thrilled. One last note, the dough will be extremely sticky. The overnight rise helps that a bit and makes for a more workable dough and, if you need to, sprinkle on a little more flour when working with it and finally rolling it out. 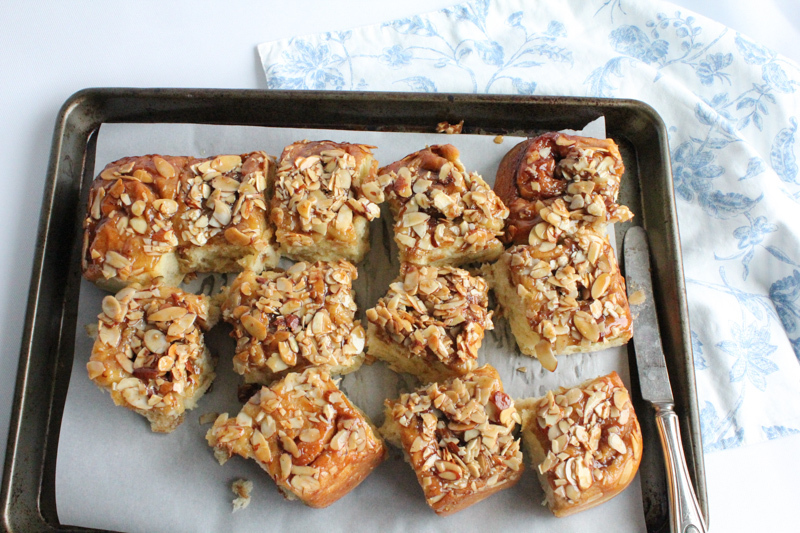 I sincerely hope you add Keys to the Kitchen to your cookbook repertoire and bake these sticky buns. Enjoy! An OVERNIGHT RISE is required for this recipe so please make sure you read and plan ahead. If you want to add the heavy cream to the glaze, add a 1/4 cup after you remove from the heat and mix well. Place the warm milk and sugar in the bowl of a stand mixer fitted with a dough hook and sprinkle with the yeast. Set aside to rest until the mixture bubbles - about 5 to 10 minutes. (If you can't get your yeast to activate in the milk like me, activate it in a 1/4 cup of warm water and then add it to the mixing bowl with the milk and sugar.) Coat the inside of a large glass mixing bowl with butter and set aside. *(see note below under "when ready to assemble") When ready, in a small bowl, combine the granulated sugar, cinnamon, cloves and salt, mix well and set aside. 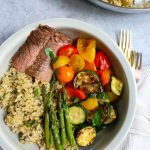 This recipe is Aida Mollenkamp’s from her Keys to the Kitchen cookbook. This recipe was shared with permission by Aida. Check these babies out. Make sure you share with friends and neighbors or you will be devouring these bad boys all by yourself! Alice – Congrats on conquering brioche! I’m glad Keys To The Kitchen could help. These are gorgeous Alice, and I´m glad you finally made them! 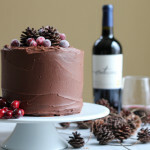 I made similar ones from a recipe by nancy silverton, and couldn´t believe how ridiculously good they were. But then, brioche is probably my favorite dough. Thank you, Paula! yes, these were SO ridiculously good!!! ah, LOVE brioche!! I received an autographed copy of Aida’s cookbook for Christmas and have been staring at the recipe. Now I know for sure I have to make them. They look amazing and sound even better! oh my goodness! YES! 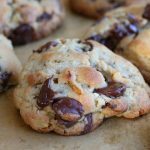 You must bake these! They are SO good . . and I seriously LOVE this cookbook. . I plan to cook almost every recipe in there! 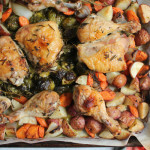 I would eat THE WHOLE PAN by myself! Alice, I am in love with these sticky buns. 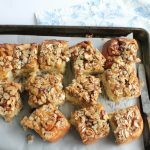 This post is perfection – you gave great tips on how to make the dough, the photos are gorgeous as always, but the true stars are the sticky buns. I’m so proud of you for making the brioche and crossing it off your bucket list. I have yet to make sticky buns/cinnamon buns from scratch and i’m dying too. 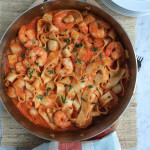 Thanks for sharing this recipe – I really want to buy Aida’s book now! oh my goodness. . I seriously love this cookbook. . can’t say enough about it. . you will love it. and thank you so much for all the sweet comments! I was quite proud of myself for making these (although I hard time starting with the yeast) and damn, after eating one, I was over the moon. So. Good. Sticky buns has always been my guilty pleasure since 2 years ago. The ooey gooey sticky syrupy bun really makes crave for more. I got Aida’s book, perhaps I should learn following your footsteps. Oh Linda, if you have the cookbook already, you totally need to bake these!!! These are delish!!! 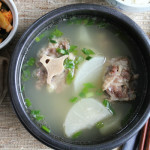 I NEVER write reviews but this recipe is to die for. I baked this for my sunday brunch this morning and it was a huge success. The instructions were very clear and easy to follow. I usually cut down on sugar when I’m baking but this time I followed the recipe to the letter. The buns were not to sweet and they were like pillows, fluffy and light. Even my mom who hates sweets had two servings! Oh yea!!! I’m so happy to hear that! 🙂 I was also pleasantly surprised at how delicious, light and fluffy they were. Seriously, all of Aida’s recipes are freaking awesome. . get this cookbook yo! Goodness gracious I need these NOW!!!! Nice work Alice, as always! Thank you so much, Lauren! 🙂 Hope you are doing well! Wow these sound so amazing! What a perfect decadent breakfast treat. Can’t wait to try them! What a nice departure from the traditional brioche. These look so decadent. Thank you for the book review I was wondering about it. You made a fantastic choice! Oh how fluffalicious. OMG these buns look amazing!! 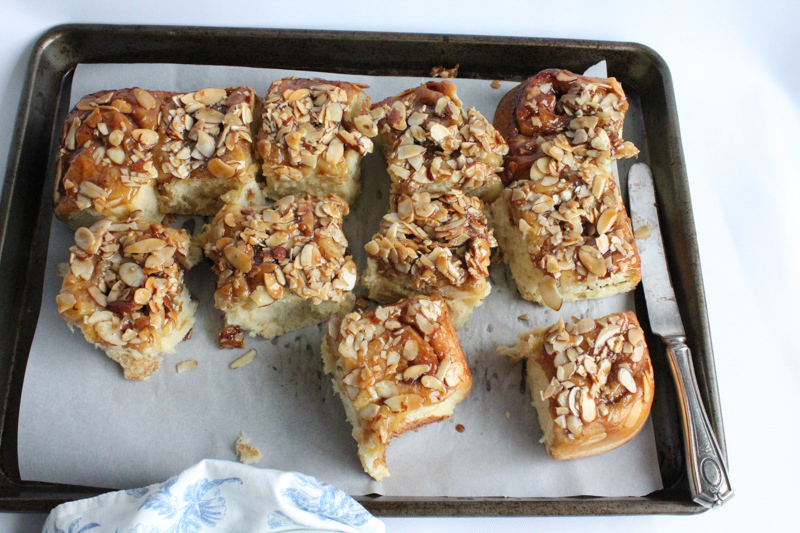 I’m such a huge fan of brioche (if I’m going to indulge in a lot of bread, brioche is at the top of my list) and almonds, so basically–yum. 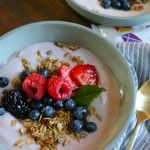 I’m with you on the whole milk–I only ever have almond milk in my fridge, so I usually use that in all my recipes…sometimes to less-than-ideal results. But it looks like 2% milk did not hurt these in the least–baking faux pas, shmaux pas 🙂 I’m putting these on my list to make, but after these…I feel like it’s time for brioche French toast to make an appearance again! Brioche French Toast?! ah, yummm! do you have a recipe? I’ll have to check our your blog! Alice!! 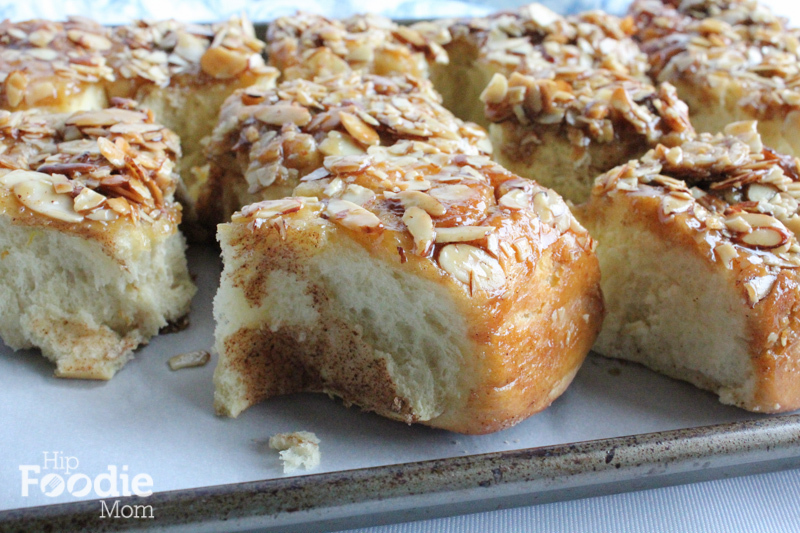 These look like the best sticky buns ever! I absolutely, positively love anything with almond and spice in it, so I’m going to get onto making these as soon as I’ve stocked up on the right ingredients (I just ran out of plain flour after making a batch of fudge cookies this afternoon). 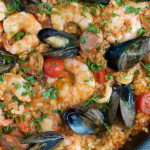 Thanks for sharing this recipe… I’ll definitely look out for the cookbook if it’s got your endorsement! Thanks for sharing. Your blog is awesome. Thank you so much for the lovely comment! Yes, yes! Buy the cookbook. . you’ll love it! and please let me know how the sticky buns turn out for you! Cheers! Sticky buns & I are definitely meant to be! I don’t think I’ve ever met one I didn’t like or love. These look a notch up on that with the brioche dough and flaky almonds, oh joy! 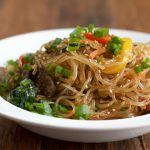 2013 Culinary Bucket List – I have one, although it’s not formally written out, but it’s in my head and every time I make something on it, I note it in the recipe to readers. For me with yeast, it was overnight cinnamon rolls and really nailing a recipe. And I got that down pat. And you clearly have brioche down pat. GORGEOUS! And have heard great things about Aida’s book but not quite as glowing as what you’ve said …if you buy only 1 book this year, buy hers. That’s huge and I will check it out!